Toyota is finally getting smart by getting Smart. The Toyota iQ Concept from Frankfurt will show up at the Geneva Motor Show as a fully capable production vehicle that will be a "break-through in compact urban transportation." And by a break-through they mean a Japanese version of the Smart (see the name). The last rumor we heard was that the iQ will be powered by Yamaha motorcycle engine, but powertrain and pricing details are scarce. Photos of the concept and press release below. 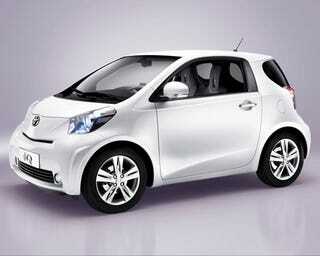 At the Geneva Motor Show, Toyota will unveil the production design of its all-new small car - Toyota iQ. First shown as the Concept Car iQ at last year's Frankfurt Motor Show, iQ will go into production during late 2008. The spaciousness of iQ is a result of its ingenious packaging, which was created by six space-saving but inter-linked engineering innovations that represent a revolution in Toyota's automotive vehicle development. Infused with Japanese design elements, iQ is a radical change in vehicle design as well as environmentally friendly transportation, and away from the belief that small cars are basic and less safe.